OTTAWA -- Prime Minister Justin Trudeau is calling U.S. President Donald Trump's decision to place tariffs on Canadian aluminum and steel "punitive" and "totally unacceptable," and has outlined dollar-for-dollar retaliation. 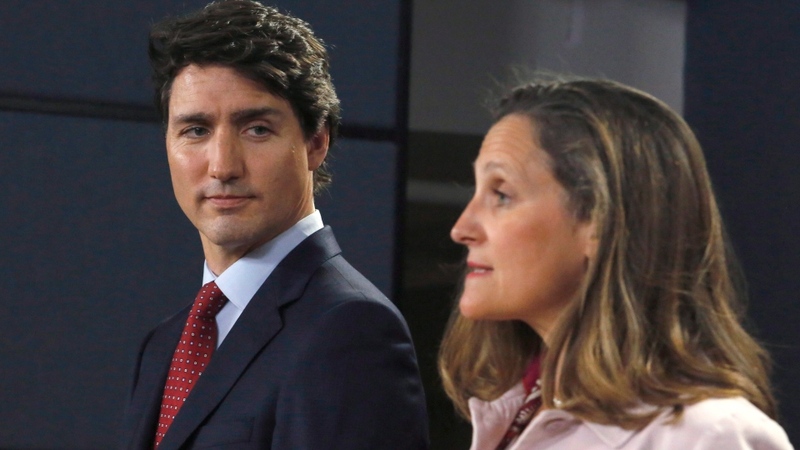 Foreign Affairs Minister Chrystia Freeland explained Ottawa’s planned retaliatory measures that will take effect on July 1, and stay in place until the U.S. backs down. Canada’s countermeasures amount up to $16.6 billion in imports of steel, aluminum, and other products from the Unites States, subjected to either a 25 or 10 per cent surtax. Freeland said this represents the value of the 2017 Canadian exports affected by Trump’s move. "This is the strongest trade action Canada has taken in the post-war era," Freeland said. "It is perfectly reciprocal. This is a very strong Canadian action in response to a very bad U.S. decision." Among the additional products originating from the U.S. that may be subject to surtax, pending a 15-day consultation with Canadians for further refinement, are specific types of: coffee, prepared meals, pizza, chocolate, condiments, toiletries, beer kegs, whiskies, various household items, and motorboats. Canada selected goods that they can easily replace with local or international alternatives, keeping in mind the cost to Canadians. Trudeau said the tariffs will harm workers and supply chains on both sides of the Canada-U.S. border, and invoked the longstanding military ties between the two countries. Trump is placing a 25 per cent steel tariff and 10 per cent tariff on aluminum on Canada, effective at midnight. This decision was made under section 232 of the U.S. Trade Expansion Act, U.S. Secretary of Commerce Wilbur Ross announced Thursday. "Americans remain our partners, our allies, and our friends. This is not about the American people. We have to believe that at some point their common sense will prevail. But we see no sign of that in this action today by the U.S. administration," Trudeau said. On CTV's Power Play, Freeland said Canada did everything possible to avoid getting here. "Trade wars don’t work," she said. Earlier in the day Ross said the U.S. would consider any retaliatory actions taken by the countries impacted, like Mexico or the EU. An overlying question is how this might impact ongoing NAFTA talks. Speaking to this, Trudeau said he was prepared to sit down last week and iron out what at that time he thought were the "final details" of "a decent win-win-win deal." However, Trudeau said U.S. Vice President Mike Pence called to inform him that his invitation to the U.S. for this meeting was contingent on Trudeau signing a NAFTA deal that had a five-year sunset clause. Trudeau rebuffed this as unacceptable, the visit didn’t happen, and now he said he looks forward to continuing to "work on" NAFTA negotiations. On CTV’s Power Play, Canadian American Business Council CEO Maryscott Greenwood said NAFTA is "done like dinner." "This came after NAFTA was already done, so this is roughing after the whistle," she said. Bracing for Trump’s decision whether or not to extend Canada’s exemption from the tariffs, Prime Minister Justin Trudeau spoke with Ontario Premier Kathleen Wynne, Quebec Premier Philippe Couillard, and Saskatchewan Premier Scott Moe on Wednesday night. All three provinces have prominent steel and aluminum sectors. According to the prime minister’s office, the four "agreed to continue to defend the Canadian steel and aluminum industry from unwarranted tariffs and to stand up for the best interests of all Canadian workers and businesses." On Thursday, Wynne held no punches in criticizing Trump’s decision, saying his "bluster and his bullying" is costing jobs. She called on her provincial counterparts Ontario PC Leader Doug Ford and Ontario NDP Leader Andrea Horwath to join her in calling on the federal government to protect steel jobs in the province. Wynne said Canada will not be a "doormat" for aggressive American trade action. Canadian criticism is coming in from all sides over Trump’s decision to place tariffs on Canadian aluminum and steel, citing national security. Freeland called it a "specious and unprecedented" use of section 232. Public Services and Procurement Minister Carla Qualtrough disagrees with the U.S. administration’s reasoning for imposing the tariffs. The U.S. interprets a threat to national security to be applicable to any threat to American industry, or economy for instance, but Qualtrough said this basis for the tariffs is "difficult to fathom." "We have such an integrated procurement supply chain that it's very difficult to fathom that there would be a security risk imposed by Canada on the United States," she told reporters Thursday morning at CANSEC, a major arms and defence trade show, before the U.S. announcement was made. "We are in no way a security threat to the United States,” she said. Qualtrough said the federal government is working to remind its U.S. counterparts of this, and while Trump’s move will have an impact on Canada’s defence industry, there are contingency plans in place. "We prepare for this kind of thing. There is money set aside whether it be for tariffs, or for interest rate fluctuations, so that we can proceed with our defence procurement should there be additional costs associated because of tariffs or other unexpected circumstances," she said. Conservative foreign affairs critic Erin O’Toole also shut down the national security argument, but said Trudeau should have done more to communicate this with his American counterparts. "In Washington, all sides of the debate view trade and security as together, as one issue," said O’Toole, adding that as soon as Trump started suggesting he may level tariffs, "Canada should have been reassuring the United States that when it comes to security, we are their partner." 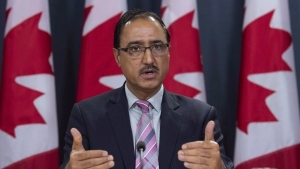 He said the Conservatives are prepared to work with the federal government on this file, saying his caucus is thinking about the impact on Canadian workers. "Clearly this is not good news," said Innovation, Science, and Economic Development Minister Navdeep Bains at CANSEC. "We're going to continue to defend the workers in the industry as well," he said. On CTV News Channel, Aluminum Association of Canada Chief Executive Jean Simard called the U.S. move "unfortunate," and also called the national security argument a "non-issue," explaining that the two countries are highly integrated when it comes to defence supply. Simard said these tariffs will have implications on both sides of the border. In Canada, he anticipates this negatively impacting the consumers and purchasers of aluminum like the auto and aerospace industries, as well as impacting the U.S. supply chain. Production: About 13 million tonnes a year. Exports: About half of Canada's production is exported, mostly to the U.S.